Art work can sometimes be perceived as an exclusive form, however in recent times emerging artists have broken down these barriers by allowing their artwork to be displayed in unconventional spaces. Viewing art has turned it’s tables. Magic in the Forest:- Imagine seeing artistic photography while on a bike ride through the mountains ? Seems too far fetched perhaps. But this ‘Trail Fairies’ project made it possible. 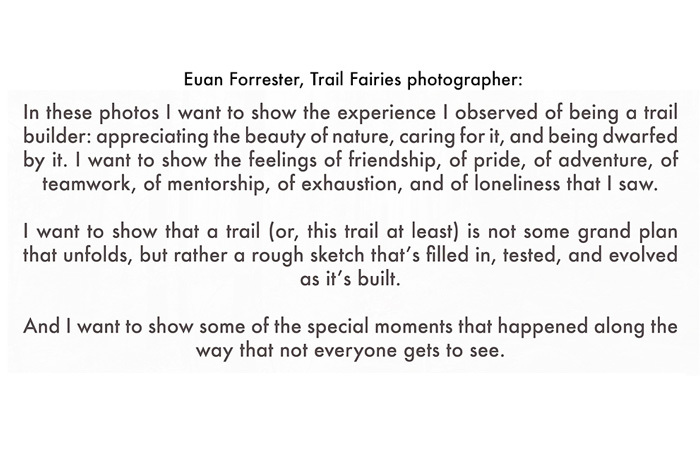 Photographer Euan Forrester decided to document Penny Deck and Martin Newman’s work as ‘Trail Fairies’ whereby they spent time volunteering to create and maintain trails in Mount Seymour, Canada. The trails are designed in the hope that bikers, hikers, walkers and joggers can plunge deeply through the trees with a visible path to guide them. 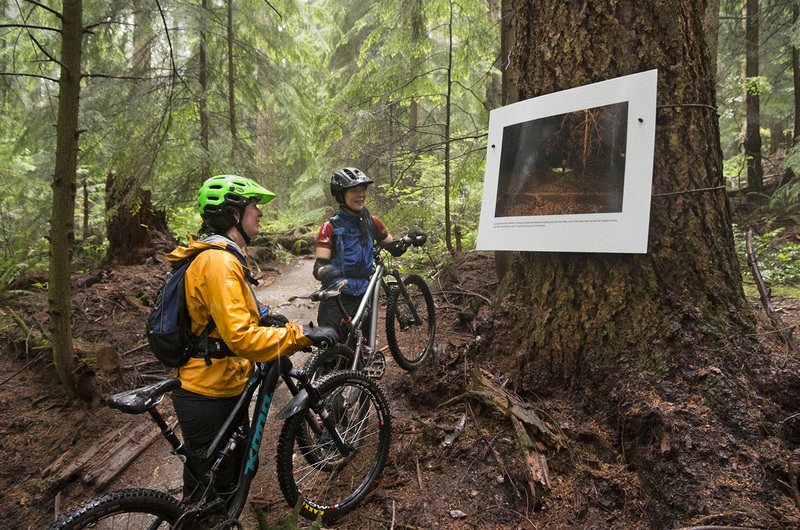 The Art Gallery in the forest pays tribute to unsung heroes who trail in the forest. This particular photography captured work in action from beginning to end, a total of nine months and 2,000 hours of work, incredible. Euan chose his favourite 20 and put weather proof versions along the mile long trail which are visible in dim light for early birds or late night foresters. The ‘Trail Fairies Exhibition’ is running up until September 2016. Fence Art:- Speaking of accessibility to artwork, when do you ever see paintings on your neighbours fence ? Very rarely. 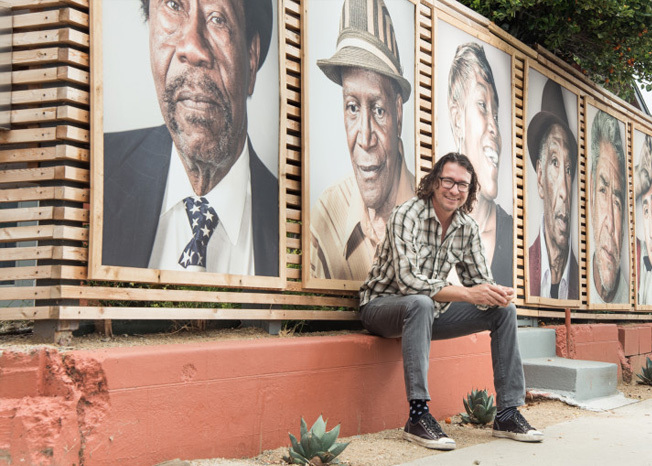 John Mireles has taken on a new form of what it means to be an artist and has showcased his neighbours in the community of Logan Heights, in San Diego. He feels that there is a misconception about Logan Heights, as there are people of different ethnicity’s and cultural backgrounds it is often deemed as dangerous and lacking in interactivity between the locals. He hopes that his artwork that is displayed on his fence will tell the story of the forgotten neighbourhood and spark up healthy discussions between the neighbours and what it means to them to be a part of that community. The artwork is essentially a juxtaposition as although the artwork of local people are on a fence, the aim of the artworks message is to break down the fence that is stopping people from communicating and the fence of ignorance and assumptions is stopping life being brought back in to the community. John Mireles also had a public exhibition in October 2015 to display his photography of the large scale portraits. Could this lead to the suggestion that artwork shouldn’t be elitist and should be accessible to everyone ? All of the Lights:- We are all familiar with dim street lights, but not lights that are fabulously aimed to prevent crime within an area. Artists David Guinn and Drew Billau are the leading collaborators within the Philly electric light mural installation. The mural has gained attention on Instagram with the hashtag #PercyStreetProject (with the hashtag you can find more photos). The lights are initially designed to tell a story of crime in Philadelphia’s Percy Street and stop familiar criminal (supposedly underage drinking and prostitution). Their ambitions are to gain better hope and security for everyone. Many locals had been involved with coming up with ideas for art work to be on properties that were amongst the dangers of Percy Street. David Guinn has stated that he loved the block as it was an interesting due to its street bends, something quite unfamiliar for the streets of Philadelphia. Will this project inspire other artists to invest their time in crime prevention? Jo Phillips. Jo is a fashion stylist, creative director and .Cent Magazine's publisher.